Busy hallways, limited resources, endless patients and complex trauma emergencies are all situations that Army medical personnel might encounter in a combat zone. The University School Hospital in Tegucigalpa, Honduras has all these characteristics, as well as personnel who fulfill complex tasks with the resources at hand successfully day in and day out. This setting provides the ideal controlled environment for readiness training and subject matter expert exchanges. Readiness is the Army’s top priority. To enhance response capabilities, the Regional Health Command Central deployed a trauma surgical team to Honduras, part of the Army South area of operations, to conduct pre-hospital care, trauma care, and work side-by-side with host nation surgeons from 11-25 August at the University School Hospital. The mission prepared 20 military medical personnel for large scale operations and provided first-hand real-life training in an austere -multi-domain battlefield environment, using local resources similar to those available in combat theatres. The USH serves as the main public hospital in Honduras and patients come in from all over the country for emergency and specialty services daily. Currently, it is the only hospital in Honduras that tends to all specialties, 24 hours a day, 365 days a year. With thousands of patients coming in and out, and with limited space and resources, the surgical backlog and orthopedic demand is high. USH also serves as the main training facility for medical residents and interns who have to adapt to the challenges of the hospital and make do much like Army medics would in a combat zone. “We have learned so much from our Honduran counterparts. We see the miracles they can do every day with the resources that they have and it truly adds perspective to what we do in the United States where we have so many supplies and the infrastructure is optimal,” said U.S. Army Col. Carlos Amaya, nurse anesthetist with the William Beaumont Army Medical Center. The joint and combined team, comprised of combat medics, emergency room physicians, occupational therapy specialists and orthopedic surgeons from the William Beaumont Army Medical Center, Brooke Army Medical Center, Evans Army Community Hospital and the Munson Army Health Clinic, had the opportunity to learn from their Honduran counterparts and experience the rapid pace of the hospital during the two week exercise; while also providing medical assistance to alleviate the country’s surgical backlog. The operational tempo at the hospital never decreases. With multiple complex injuries and patients, the medical staff has to be intuitive and learn how to make clinical decisions to determine the appropriate course of action. Doctors have to think fast and take action even when they don’t have all the information. 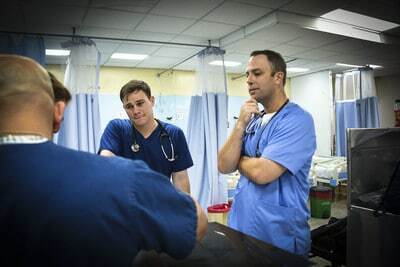 Summers, who was serving in the ER, was teaching his combat medics how to hone their decision making skills for emergencies and forward surgical care in alternatively resourced environment, while they all learned how to do more with less from the Honduran doctors. “In combat you have minimal resources at hand so you have to make do with what you have; that is what this facility, this location and these doctors have taught us. They are quick and have taught us quite a few things that I wouldn’t have dreamed of doing state side,” said Staff Sgt. Jose Calderon, a health care specialist with the MAHC. Army medical personnel have unlimited resources and the best settings to practice their medical abilities in the United States. However, soldiers, airmen and marines would experience penetrating trauma in the field, such as gunshot wounds, orthopedic injuries, open fractures or the need for chest tubes in locations where these commodities and resources are unavailable. The training objective also consisted of deploying the team to execute hand and orthopedic subspecialty care, as well as conduct trauma control surgery and training with Honduran counterparts, incorporating RHC-C combat medics into each area to gain proficiency in mission essential tasks through forward and combined provision of patient care. The mission was carried out through coordination and support from the Joint Task Force-Bravo Medical Element. Dr. Ricardo Aviles, MEDEL liaison officer, was in charge of communicating with the USH and local Ministry of Health to provide support in screening, both pediatric and adult patients, and later selecting those who were the best candidates for the surgical portion of the mission with the team. “We have been in direct communication with Dr. Ricardo Aviles from JTF Bravo for some years now and he has coordinated several orthopedic missions. The hospital is highly benefited since these are programed surgeries that are usually hard to complete due to the daily tasking of the hospital. We see a lot of trauma and we are overstocked with emergencies, receiving references from all over the country,” said Dr. Ramon Lagos, pediatric orthopedic specialist at the USH. Waiting lists for orthopedic surgeries can take as long as six months up to a year to get scheduled due to the high demand of emergencies in the country. Erika Flores, a young mother whose 11 year old son was an orthopedic surgical patient during the mission, was very grateful and spoke about her hopes for his future. “He used to be a boy who could not move on his own; he had to wear crutches or use a wheel chair. This surgery has helped him and us greatly because now he can do things for himself, he will be happy and will be able to enjoy soccer like he wasn’t able to until now. He can go to school now and not depend on crutches and wheel chairs,” she said. Erika’s son suffered from a congenital bone deformity and received osteotomy in both his legs to correct this, allowing him the opportunity to be able to walk upon recovery. “It’s been very successful and a lot of work but in the end the results have been excellent and what’s most important is the patients receiving care. We are very grateful to the US government who support us tremendously through their armed forces and Joint Task Force Bravo with these missions,” said Lagos. The mission also included a joint rehabilitation portion, where an occupational therapist from WBAMC was joined by two JTFB MEDEL service members to assist in physical therapy services in the hospital. Together the team was able to see pediatric and adult patients, adapting to limited resources, simulating a situation that an occupational therapist might face in a deployed environment. “We would be so busy in the beginning of the day evaluating patients that probably have been waiting to be seen for months. I don’t typically deal with these types of patients at Soto Cano Air Base so it was great to be able to learn and add some new tools. I think this mission helped me be prepared to adapt to situations and challenges that I may not be accustomed to,” said Spc. Devyn Leslie, JTFB MEDEL physical therapy technician. The occupational therapy team fabricated basic hand and wrist splints using traditional splinting material throughout the operation. Lt. Col. Henderson Brenner, JTF-Bravo Medical Element physical therapist, highlighted the importance of familiarizing with assessment and treatment of common hand and wrist impairments. The orthopedic mission allowed service members to step out of their comfort zone and witness cases that they would not have the opportunity to see in the U.S. The mission also exposed them to a different environment where they have to plan and execute, adapting to limited resources and combined personnel while treating real world injuries in a fast paced environment. “The experience that we’ve had has been outstanding. We have learned indeed that there are really no excuses. Its unquestionably one of the best experiences of my life and I would like to thank my Honduran counterparts for welcoming us into their country and for sharing their knowledge and experiences with us,” said Amaya. The Regional Health Command-Central deploys specialized surgical teams to conduct complex medical procedures in cooperative environments to support the Combatant Commander’s theater activities. These ARSOUTH funded medical missions provide the US military medical teams with a readiness platform that gives them an opportunity to broaden their medical proficiency and skills while collaborating with host nation health care efforts. During the two week collaboration, the combined team saw 216 patients and performed a total of 74 surgeries, enhancing their abilities to deploy while fostering good will among partner nations through medical cooperation.